Convenience and cost are two great words to describe why a Jiffy Lube gift card bought for a discount price is a good thing. First the convenience. With over 2,200 locations, finding one when you need it will be easy. And because gift cards are a form of currency, just like cash, you can use it at any location. As for as cost- well, that one is easy. Your discounted card will save you money on all your vehicle’s maintenance. Owning a car can be expensive, but we help you out by cutting some of the cost down. From oil changes to air conditioning services, you will save money! What started in Utah in 1971, is today a household name. Why take your car anywhere but the best? And when you buy a discounted Jiffy Lube gift card, you will pay less money on the entire bill. Which is excellent news because they offer just about everything and anything your car may need. Air filtration services, alignments, battery maintenance & replacement, suspension services and so much more! Finally, you can keep your vehicle in tip-top shape, without going broke! So, get your discounted Jiffy Lube gift card today and trust the professionals to treat your vehicle with the care it deserves. Whether you’re looking for fleet services or just regular maintenance, you and your car will be in good hands. And what’s more, all coupons and store promotions remain valid when you use your card. Finally, saving money on your car’s needs is easy! A Jiffy Lube gift card is your ticket to saving money on everything you need to maintain your car! But did you know Cards2Cash offers other gift cards, as well? In fact, we carry a vast selection of them! Everything from retail stores, and restaurants to websites! If you would like to save even more money, check out our listings for Advance Auto Parts, Auto Zone, Belle Tire, Napa Auto Parts, and more! With Cards2Cash, your car will be in better shape than ever before, for less money out of your pocket! 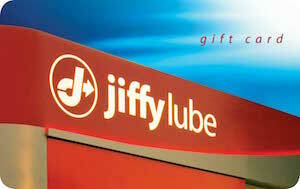 Do you have a Jiffy Lube gift card you longer need and would like to sell? If so, then look no further! Cards2Cash buys lots of gift cards! And what’s more, we pay top dollar for them! If interested, stop by one of our retail locations for money paid to you right on the spot, OR just fill out our easy online form and we’ll get back to you with an offer for your unwanted card! Cards2Cash is your one-stop gift card shop!